Will newspapers' decline weaken democracy? Thomas Jefferson once famously remarked that if he had to choose between government without newspapers or newspapers without government, he wouldn't hesitate to preserve newspapers. 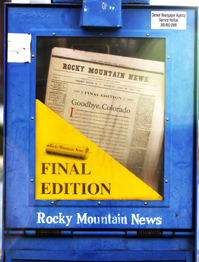 Today, however, newspapers across the country are declining in circulation, advertising and profitability. Some are ceasing to publish. Others are reducing or closing Washington and state-capital bureaus, laying off staff and cutting back the news coverage they provide. Many journalists, scholars, political activists and government officials worry that government without newspapers could be on the horizon, and that citizens then would be unable to obtain sufficient information for effective self-government. As more Americans turn to the Internet and cable television for news, however, others are hopeful that new forms of journalism will fill the gaps. Meanwhile, newspapers are attempting to give themselves new birth online.